A first novel sets the youthful ordeals of Maya, an idealistic and somewhat imperceptive American student at Israel’s Hebrew University, against both the historical and contemporary struggles of Western Jews. 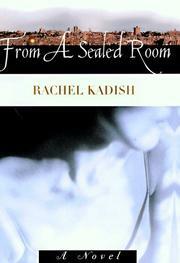 The “sealed room” of the title refers both to the gas-proofed area in Israeli homes created during the Gulf War and to Maya’s uneducated heart. Her Israeli relatives Tami and Nachum, with their soldier-son Dov and daughter Ariela, offer domestic comfort as they struggle with the reticent Dov, who has recently lost an Army buddy. Shortly after her arrival in Jerusalem, Maya moves in with Gil, a passionate artist who was discharged from the Army under a cloud. She becomes the submissive recipient of his love and of his sudden, violent rages. Meantime, a neighbor, disoriented Holocaust survivor Shifra Feldstein (something of a mystic), believes Maya to be a kind of savior and presents her with gifts and cryptic messages. Along the way, the story is occasionally interrupted by Shifra’s grief-clouded ruminations on the course of her life, though the verbal drift of her musings deprives them of much solid resonance. Maya goes camping with Dov and his friends, is beaten and raped by Gil, and receives word of her mother’s impending death from cancer. Shifra’s own sudden demise precedes Maya’s return to America, where her mother reminisces, then becomes reconciled with her daughter, in the process clarifying some of the emotions and experiences Shifra had shared with her. Maya returns to Israel, dumps Gil, and vows to try to see Israel as it really is. The portrait of Maya is compelling, and her confusions and doubts are persuasive, but comparing her experiences with dangerous boyfriends and an ill mother to the Palestinian peace talks is a stretch. The tale doesn’t need, and can't sustain, the larger geopolitical and historical implications that are added to it.